THE CAMPI FLEGREI TUNNEL on the new direct railway route between Rome and Naples has a length of 1,939 yards. The construction of the Rome-Naples “Direttissima” included some twenty-one miles of tunnelling on the 134½ miles line. 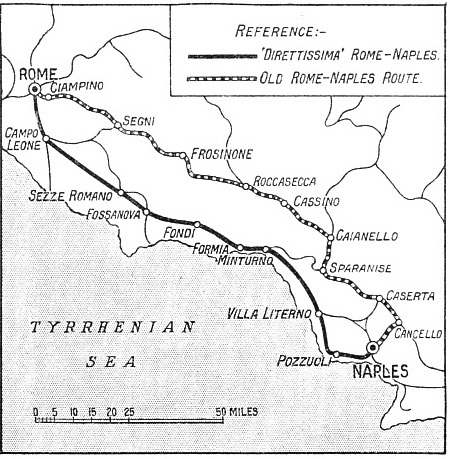 THE Rome-Naples route, opened for traffic in 1927, was the first line in Europe to which the expression “Direttissima” was applied. “Direttissima” means, as explained in the chapter “The Great Apennine Tunnel”, which begins on page 320, the most direct route. The word, new in the language of the railway world, has been perpetuated in a memorial tablet in the vestibule of the Terminus Station at Naples: “La Via Ferrata Direttissima” - the most direct iron way. The “Direttissima” represents a vital link in the communications between the south and the north of Italy. It is only since the opening of this line that the vast natural resources of southern Italy have become available to their full extent. At last adequate means of transport have been provided to carry the products of an exuberant soil and climate to northern Italy, and far beyond the frontiers to the northern countries of Europe. Apart from its importance on this account the “Direttissima” brings Naples almost to the door of Rome. Naples is the principal passenger port of Italy, and one of the chief ports in the Mediterranean. Its importance has now become enhanced, as it has virtually become the port of Rome. As long as the old line was used a journey from Rome to Naples and back was so fatiguing that many people stayed overnight in either of the towns or travelled one way overnight. With the opening of the “Direttissima” however, the duration of the journey was reduced from four and a half hours to two hours and three-quarters. The new journey is in a different category from the old. In the apt words of the Minister of Communications at the opening of the line, the passenger, instead of being burdened with suitcases, now merely puts a spare handkerchief in his pocket. The route of the “Direttissima” is of absorbing interest for its historical and archaeological associations, and for its natural beauties. The traveller passes through the Campagna Romana, with its herds of buffalo and horses. He sees aqueducts built by the Romans and still partly utilized, one of them being incorporated in that which Pope Sixtus V built in 1585. The trains flank the famous Via Appia which Appius Claudius built in 312 BC, still visible in its original state. They cross the Pontine Marshes, once a pestilential, death - stricken and malaria - ridden marshland; now, since its reclamation in 1933 a vast expanse, comprising thousands of acres of cultivated land with new, flourishing towns that have sprung up as if by magic. A new province has been formed out of the reclaimed lands. OPENED TO TRAFFIC IN 1927, the direct Rome-Naples route is a vital link in the communication between north and south Italy. Its construction reduced the rail journey between the two great cities by thirty-five and a half miles. On the Volscian hills are towns planned within cyclopean walls where those indomitable fighters, the Volscians, stayed the Roman onslaught for decades. Terracina, the ancient Anxur, once the capital of Volscians, and later a famous pleasure resort of the wealthy Romans, is famous to-day for its luscious grapes grown on the volcanic soil. The line passes endless vineyards that empty their golden treasure into thousands of trucks waiting on the sidings of the “Direttissima”. It runs close to the Via Appia, with its Roman tombs and a quaint gate with two towers that once indicated the frontier between the Pontifical State and the Bourbon Kingdom of Naples. Then comes Formia, on one side of the Gulf of Gaeta, where Cicero’s famous villa stood. Farther on are the ruins of the summer residence of Faustina Augusta, restless consort of Marcus Aurelius the Emperor-Philosopher. Mondragone lies on the border of the district of Falerno, renowned for its wine that Horace and Byron praised. The Campi Flegrei derive their name from the Greek word phlegron, which means “burning”, given to it by the first Greek settlers, because the whole district is volcanic. The extinct volcanoes manifest their presence farther on in the Solfatare, sulphur springs of high medicinal value. The station at Pozzuoli dominates the bay from Cap Miseno to Posilippo; in the distance is seen the island of Capri with its blue grottoes. Finally the trains run through the hill of Pozzuoli, with the tomb of the poet Virgil, who wrote some of his poetry at Naples. In front is the Gulf of Naples, with Vesuvius in the background. And many more points of historical interest are passed that carry the traveller’s mind back through the centuries. The old railway line between Naples and Rome was begun between Naples, Caserta, and Capua by the Bourbon kings in 1843. In 1857 the Pontifical Government constructed the line from Rome to Ciampino and Frascati, which was afterwards extended from Ciampino to Velletri and Frosinone. In those days of little traffic the main purpose of a railway was to provide better communication between the capital and the principal provincial towns. Later on, Garibaldi, when he had become the master of the south of Italy, built the continuation of the line from Capua to Ceprano, which was the frontier of the States of the Church. In 1863 the Pontifical Government built the line from Frosinone to Capua, thus completing the direct communication between Rome and Naples. The length of this line is 170 miles, and it is still used. The “Direttissima” has a length of 134½ miles - thirty-five and a half miles less than the old line. Only twenty-six miles are in curve. The straight stretches of the “Direttissima” are generally long, such as that between Campoleone and Cisterna, which has a length of six and a half miles. The longest straight run is between Carano di Sessa and Falciano Mondragone, with a length of ten and a quarter miles. The curves on the “Direttissima” have a very wide radius, generally 1,100 yards. Only a few have a radius of 880 yards. The “Direttissima” branches off the Rome-Cassino line one mile after leaving Rome. From this point the whole line follows its own route, although it runs parallel to the old line for a few miles, first on its left and then on its right. The “Direttissima” then heads for the sea. The track is laid over soil of volcanic origin, and frequent cuttings have been made in the volcanic tuft. The building of the track did not present any difficulties. The number of constructional works is, however, noteworthy, and was necessitated by the frequent crossings over and under railway lines, tramways, and roads. The two principal viaducts on the first section are those over the Pagliano Casale River, which is made up of seven arches of 49 ft span each, and that over the Vittoria Torrent, which has six arches of 46 ft span. At one point the line crosses under the Via Appia by a tunnel 165 yards long. At the station of Campoleone twenty-one miles from Rome, the highest point of the line is reached, at an altitude of 414 ft above sea-level. FORTY-SEVEN IMPORTANT BRIDGES and viaducts and 640 with smaller spans are included in the Rome-Naples “Direttissima”. This illustration shows the fine steel girder bridge of 230 ft span which carries the rails across the Garigliano River. After the next station of Cisterna the volcanic soil comes to an end. Thirty-eight and a halt miles distant from Rome is the new station of Littoria, built in 1933. when Littoria, the first town on the reclaimed Pontine Marshes, was inaugurated by Signor Mussolini. The track crosses several bridges, among which are two steel girder bridges with single spans of 46 and 60 ft respectively. After the station of Sezze Romano (forty-four and a half miles) the line proceeds on a straight route as far as the station of Priverno-Fossanova (fifty-three and a half miles). The ground at the time of the construction of the line, that is, before the reclamation of this vast territory, was marshy and consisted of clay and turf, the decomposed material of shrubs and trees. The construction of the embankments was a difficult matter, and particularly that of the foundations for the many bridges and viaducts which were necessary for negotiating the numerous roads, watercourses, and stagnant pools. The foundations were laid over concrete piles connected by concrete platforms. The construction of the foundations for the skew bridge over the River Ufente presented special difficulties. So did an undercrossing about forty-seven miles from Rome, where the foundations were sunk by means of compressed air caissons to a considerable depth below the deep bog. Between forty-nine and fifty miles from Rome the line leaves the Pontine Marshes, as this point was one of the worst places in the marshland. The marshes were by-passed by carrying the line through the Leppini Mountains, by means of two tunnels of 996 and 535 yards long respectively. It should be remembered that the reclamation of the Pontine Marshes began in 1931, four years after the completion of the line. After the station of Priverno-Fossanova the line crosses the Amaseno River by a masonry bridge of four spans, three of 59 and one of 22 ft. It then enters Monte Orso Tunnel, which has a length of 4 miles 1,195 yards. It is the longest tunnel on the line. The tunnel was bored through calcareous rock of cretaceous formation, and no difficulties were encountered. During the tunnelling a vast cavern was discovered, which had evidently been formed by the dissolving action of water on the dolomitic rocks. On leaving the tunnel the line descends the Viola Valley into the Plains of Fondi and reaches the station of Monte San Biagio. On this last section the line is laid over alluvial ground of an old reclaimed marsh. Special precautions had to be taken in the construction of the foundations of bridges and buildings. After the station of Fondi the line rises for about three miles on a gradient of 1 in 100, and enters a short tunnel of 140 yards, which is followed immediately by the Viola Tunnel, which has a length of 4 miles 1,111 yards. This tunnel, which was bored through dolomitic rock, presented no difficulties. On emerging from this tunnel the line runs below the rocky Monte Mola and traverses the Rialto Tunnel (865 yards) before reaching the station of Formia, eighty miles from Rome. SECTION OF ELECTRIFIED TRACK on the “Direttissima”. The system adopted is direct current at 3,000 volts, power being supplied by overhead transmission lines. In connexion with the electrification of the line, electric automatic block signalling has been installed over the entire route. The track now runs parallel again to a branch of the old line for about two miles, crosses under it, and joins it again at the station of Minturno after passing through the tunnel of the Madonna di Ponza (241 yards) and over a noteworthy steel girder bridge with a single span of 138 ft. 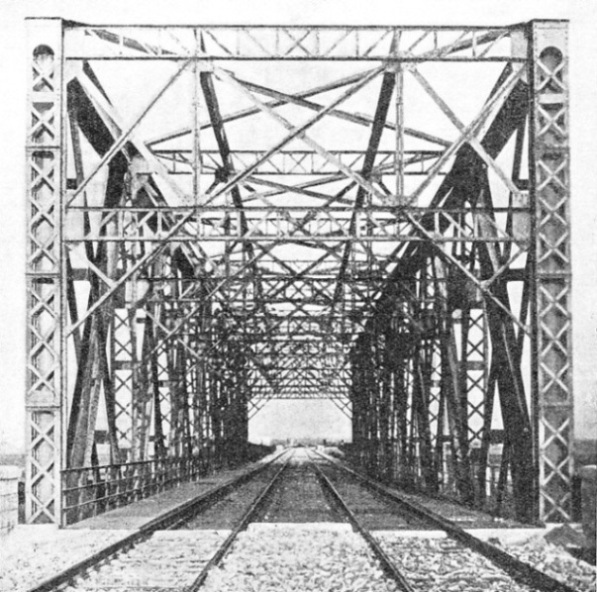 The line then crosses the Ausente River over a bridge composed of three independent steel girders resting on masonry piers. The central span has a length of 73 ft and the two lateral girders are each 17 ft long. The piers were built over deeply sunk reinforced concrete piles carrying a reinforced concrete platform of unusually large dimensions. The piles had to be sunk to a depth of eighty feet because of the unstable soil consisting of clay and turf. The Garigliano River is then crossed by a steel girder bridge of 230 ft span. The foundations of the piers were laid 60 ft below the level of the river at low water, which is four inches above the level of the sea. from Rome, a stretch of four and a halt miles where the soil consists of earthy tuff, ashes, and small stones - residue of the eruptions of the now extinct volcano of Roccamonfino. After the station of Carano di Sesso the line enters the tunnel of Monte Massico, which has a length of 3 miles 600 yards. The tunnel is bored on this side through volcanic and alluvial deposits and afterwards through cretaceous, mostly liassic lime, which is compact in composition. Four caverns were encountered in this tunnel, one of which had a volume of 52,000 cubic yards. The line next runs through the quaternary plain of the Volturno River and passes the stations of Falciano-Mondragone, Cancello-Arnone, and Villa Literno. A large number of bridges, mostly steel girder constructions, over rivers and irrigation canals, are to be found on this section, which is laid on a high embankment. The Volturno River is crossed over a fine steel girder bridge of three spans of 116 ft span each. The masonry piers and shoulders rest on reinforced concrete foundations sunk to a depth of 50 ft below low-water level, which is 10 ft above sea-level. The foundations are set into banks of lava which run practically in a horizontal direction and have originated from volcanoes in the distant past. At Villa Literno a new double-track line branches off to Aversa on the Naples-Benevento-Foggia line. This branch has a length of nearly nine miles. Soon after Villa Literno the line enters the zone of the Campi Flegrei and negotiates, after passing the station of Giugliano-Qualiano, the crater of Pian di Quarto, through the borders of which the two tunnels of Monteleone and of Monte Spaccato are bored. Their length is 1 mile 300 yards and 432 yards respectively. 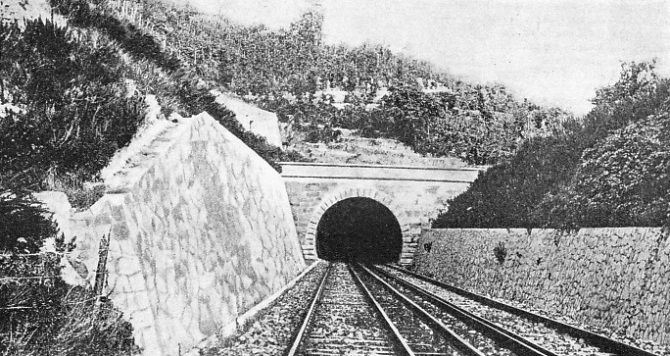 On emerging from this tunnel the line runs in a deep cutting in the compact pozzolana and reaches the station of Pozzuoli. The Filangieri River is now crossed by a masonry bridge of six arches of 46 ft span, and the line enters the Campi Flegrei Tunnel, which has a length of 1,939 yards. This tunnel is bored through the slopes of the great Solfatara crater and presented considerable difficulties because of the extreme hardness of the rock and the high temperatures encountered. These reached 130° at the headings in certain points. Heavy emanations of carbonic acid had to be overcome by powerful ventilation plants. Carbonic acid, being heavier than air, tends to settle near the ground, and is, therefore, particularly dangerous for the men working at the headings. 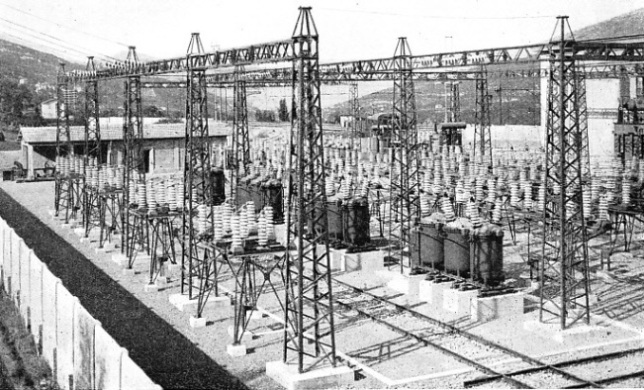 A TRANSFORMER SUB-STATION on the Rome-Naples “Direttissima”. The photograph shows an installation in the open viewed from the side of the incoming primary 60 kV lines. 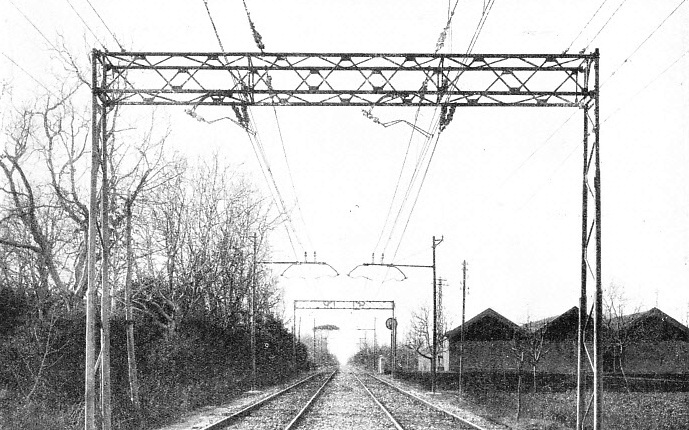 The electrification of the whole line was completed by October, 1935. Soon after emerging from this tunnel the line reaches the station of Naples-Campi Flegrei and negotiates the Posilippo Hill by means of a tunnel 1,660 yards long. After a short run the terminus of the “Direttissima’’ is reached at the imposing station of Naples-Mergellina, where the Rome-Naples Express trains end their journey. The line is, however, carried farther, and runs through a short tunnel with three tracks below Corso Vittorio Emanuele, the main thoroughfare of Naples. After a short stretch in the open it enters the last tunnel, which has a length of 3 miles 670 yards. The line ends at Piazza Garibaldi Station. The section between Mergellina and Piazza Garibaldi is the nucleus of the future Metropolitan Railway of Naples. Between these stations three intermediate stations have been constructed. They are connected with the street above by escalators. The tunnelled lines are 98 ft below the street level. The total length of the tunnels on the “Direttissima” (as far as Mergellina Station) is twenty-one miles. The avoidance of level crossings along the whole line necessitated an unusually large number of over- and under-crossings, bridges, and viaducts. In all there are forty-seven important constructions of this nature and 640 with spans of less than 33 ft. Twenty-five stations between Rome and Naples have been laid out. The whole track is heavily stone ballasted to a depth of 2½ ft. The rails on the open tracks weigh 93½ lb per running yard, and 102 lb in tunnels. For each length of 13½ yards seventeen sleepers have been laid in the open and eighteen in tunnels. 265,000 cubic yards of masonry work, and 1,100,000 cubic yards of ballast were required. The total length of the lines, including sidings, is 313 miles, for which 35,500 tons of rails, 10,000 tons of accessories, 628 points, and 570,000 sleepers were used. Twenty-four staff dwellings for 176 families and twelve station buildings were erected, as well as large goods sheds, four locomotive sheds, one depot, two repair shops, and nine buildings for sundry purposes. For the supply of water eighty-six miles of new lines were laid down, and ten water towers of a capacity of 210,000 gallons were constructed, besides three reservoirs of 300,000 gallons capacity, equipped with some powerful electrically driven pumps. At the time of construction hydro-dynamic and electro-dynamic signalling and block apparatus were installed, with a total of 1,560 levers. The entire signalling block system is at present in course of reconstruction and electric automatic block and signalling is being installed in connexion with the electrification of the whole line, scheduled for completion by the end of October, 1935. The system adopted is by direct current at 3,000 volts, current being supplied by overhead transmission lines. Whereas the old line reaches an altitude of 1,090 ft near Segni and descends to 107 ft, rising again to 650 ft, the highest point of the “Direttissima” is at 414 ft above sea-level, from which it descends to 13 ft, rising again to 308 ft. On the old line there were gradients of 1 in 58, whereas the new line has nowhere gradients over 1 in 100. The saving affected on the journey is at present one hour twenty minutes. 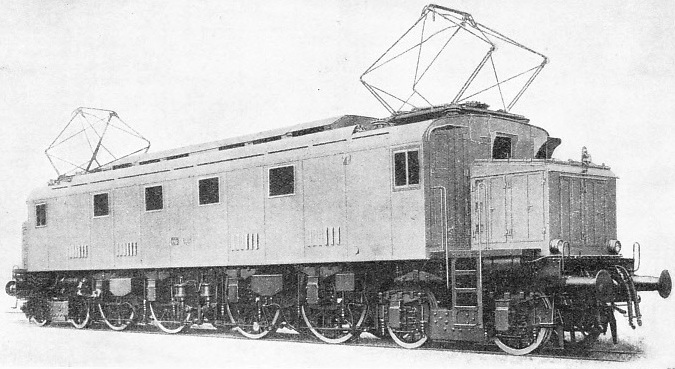 On completion of the electrification of the line, the distance from Rome to Naples will probably be covered in two hours, and possibly in even less time, as the Italian State Railways have new types of streamlined electric trains, composed of three articulated coaches, under construction. Each of these streamlined expresses is designed to achieve a speed of about one hundred miles an hour. A MODERN ELECTRIC LOCOMOTIVE built for express work on the Italian State Railways. The introduction of powerful electric locomotives on the Rome-Naples “Direttissima” has greatly improved the service on the 134½ miles journey. You can read more on “The Great Apennine Tunnel”, “Milan Central Station”, “Modern Construction in Italy” and “The Rome Express” on this website.